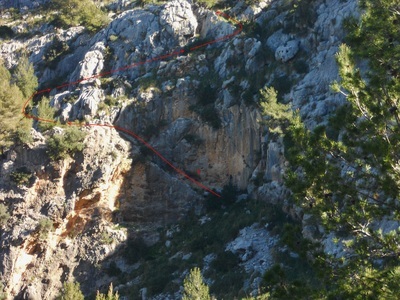 Difficulty: Medium High on the Pas de S'Heura and Pas d'En Barona on the summit route, Medium low otherwise. The circular route around the mountain is described clockwise, but can be undertaken either way. 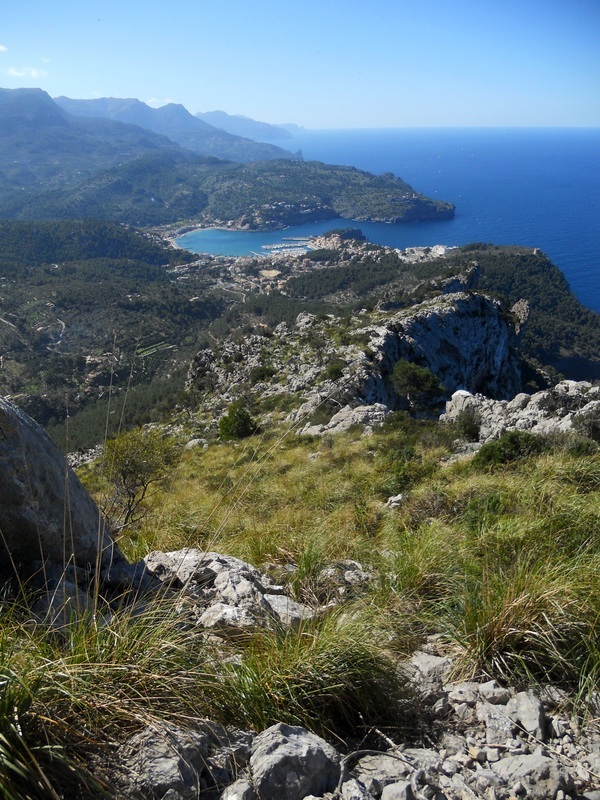 The walk offers impressive sea views for the first part, then will become more adventurous and take you to remote parts of the wild Na Mora valley, before rejoining the less isolated Ballitx valley and returning to Port de Soller through a maze of terraced Olivars. The walk is extremely well marked with cairns and presents no orientation difficulties when navigated with the relevant hiking map.The Pas de S'Heura is a scramble, moderately exposed in places; this makes the walk unsuitable for young children and best avoided in canine company. The summit route is best walked from west to east, as the Pas d'en Barona might be difficult to identify and pass going downhill; the cave of Migdia (midday) is a must see along the way. 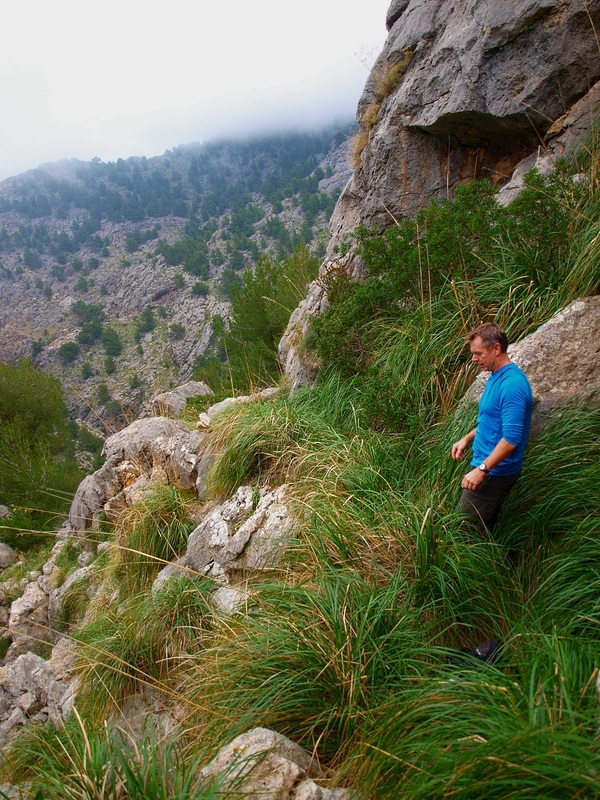 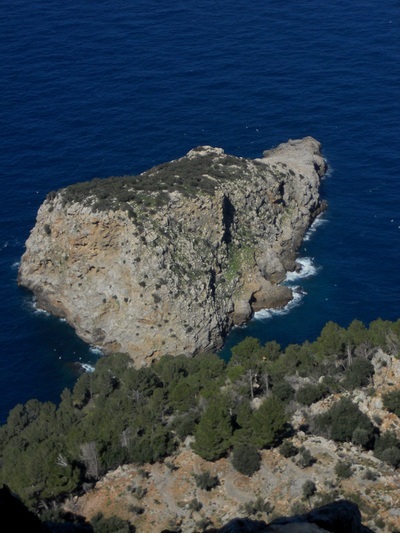 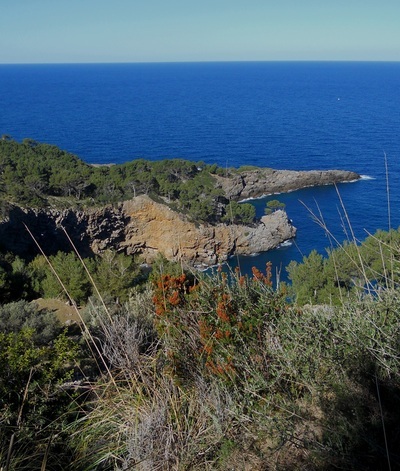 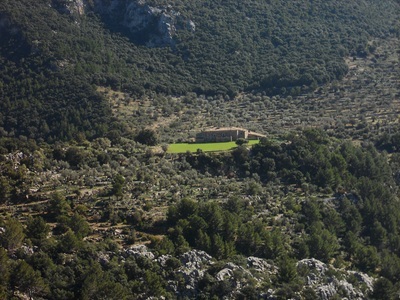 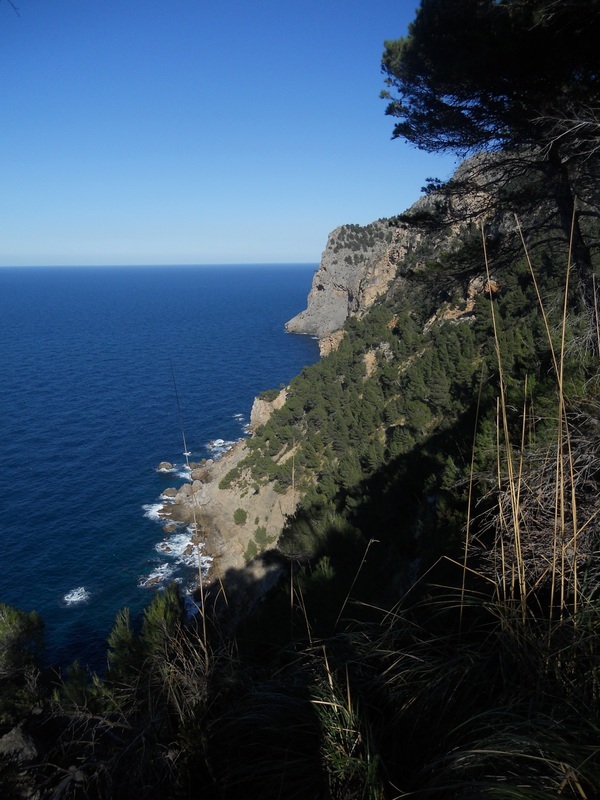 The two walks can be combined into one starting off on the coastal track, climbing through the Pas d'En Barona to the summit via the cave, continuing toward Ballitx d'Amunt, pushing on towards the Pas de s'Heura and the pass de Cala Ferrera, returning along the coast to Port de Soller. 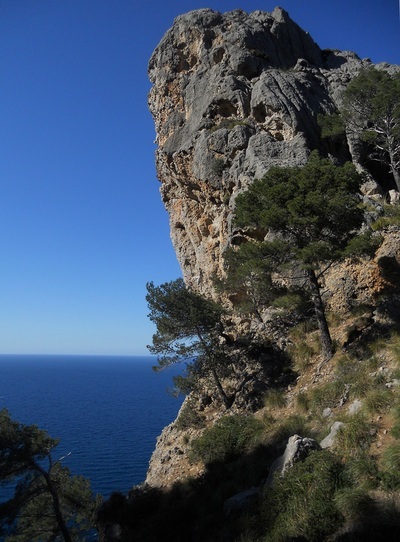 This is a full day walk. These are rewarding walks for those who want to blend a touch of adventure with stunning wilderness. 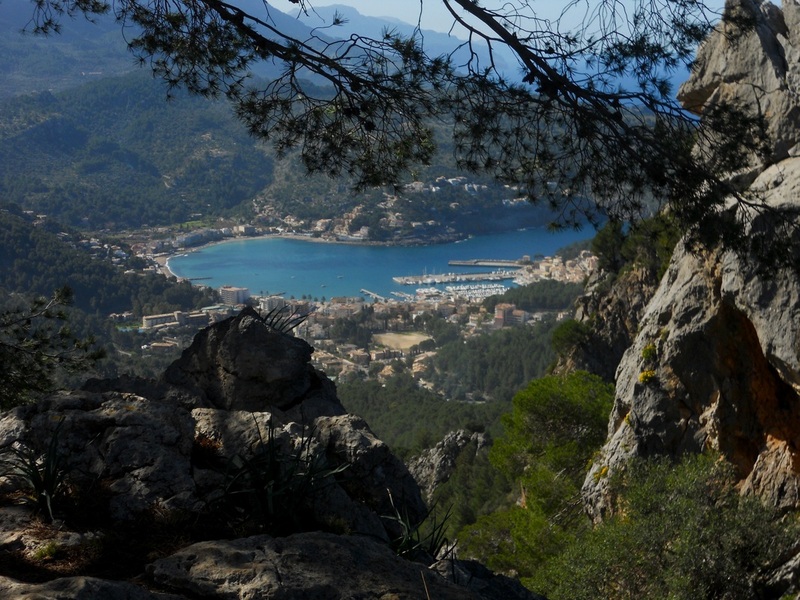 Driving: take the tunnel from Soller to Port de Soller. At the first roundabout, go straight ahead (second exit); park the car on the large esplanade with trees in the middle surrounded by low apartment blocks some 50 to 100 m further along (Place des Reis de Mallorca). By bus: The main bus stop is a 100 meter away from the esplanade mentioned above, just back track along the bus route. 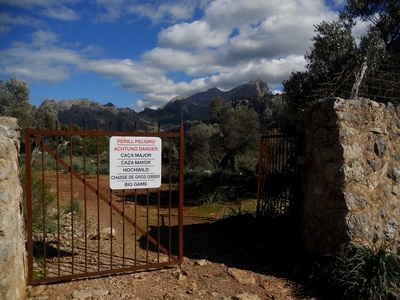 From the esplanade, walk up the steep road (c/ Belgica) going north at the square entrance between the bar & restaurant, and go straight ahead at the first bend on a narrow asphalted lane with a dead end sign and the remnants of a gate. 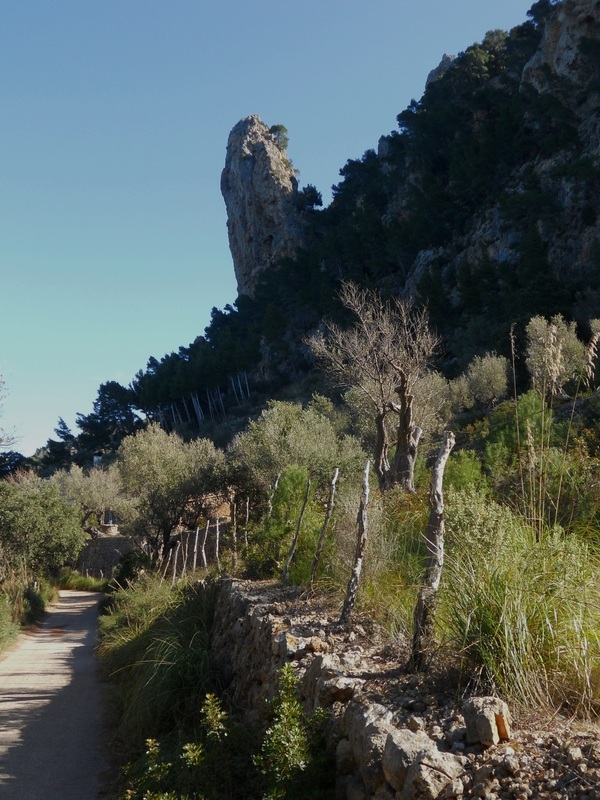 Follow the lane up the hill, keep on the main track ignoring the the turnoff to Torre Picada watchtower and Punta Larga. The track will soon level off and follow the coast at a fair height above the sea, passing by a number of small rural houses along the way. 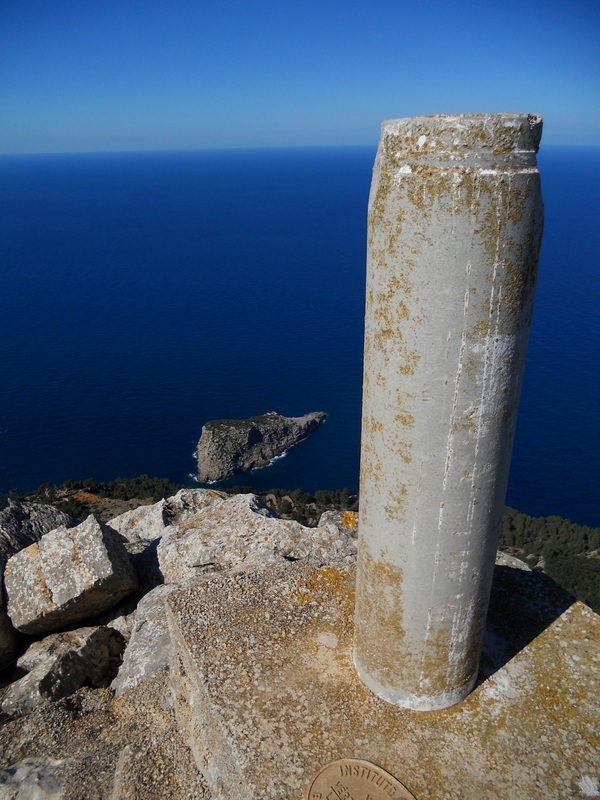 After climbing up the track from the car park area, you will walk along a wide dirt track towards s´Illeta island and the Penyal Bernat, a very phallic shaped pinnacle. 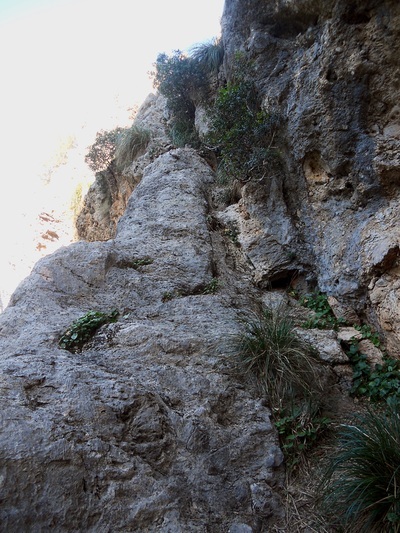 Beyond that, after passing an exceptionally manicured set of rustic villas, a gated cemented track splits to the right; this is the start of the summit walk (described in the next section) . Keep straight ahead to go towards the Cala Ferrera pass. 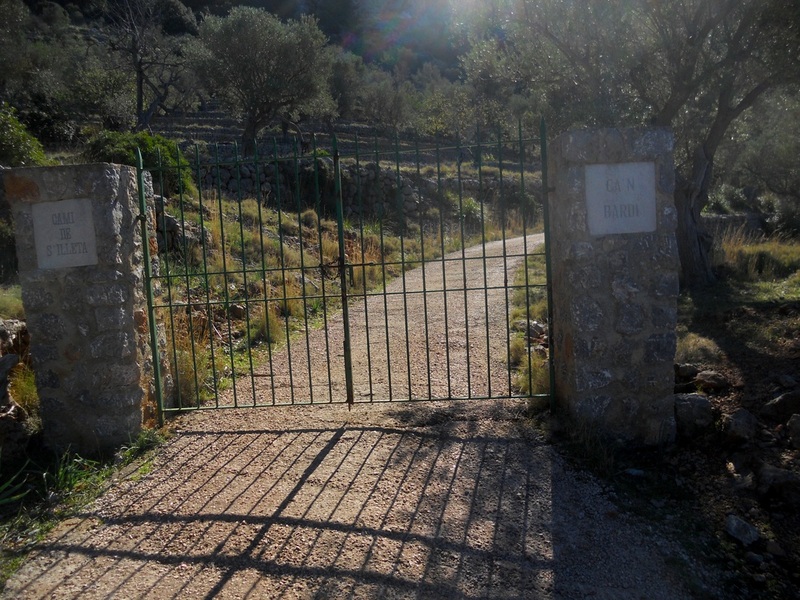 Pass a gate with a style on the side, follow the track a couple of bends down and take the right fork onto a well marked, level trail. 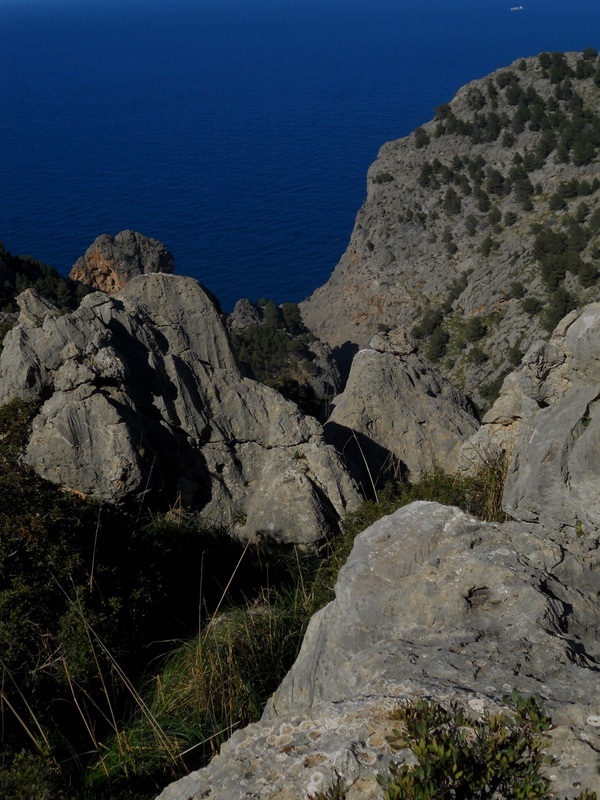 Follow this cairn marked trail all the way to the Cala Ferrera pass (30 min), ignoring a downhill path on the left. If you loose the cairns, backtrack. 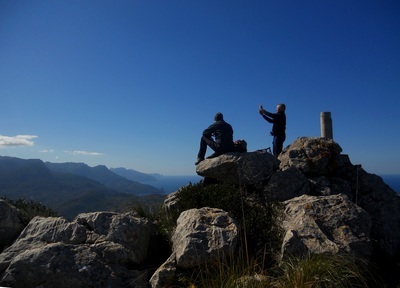 It is worth spending a minute getting your bearings at the pass. 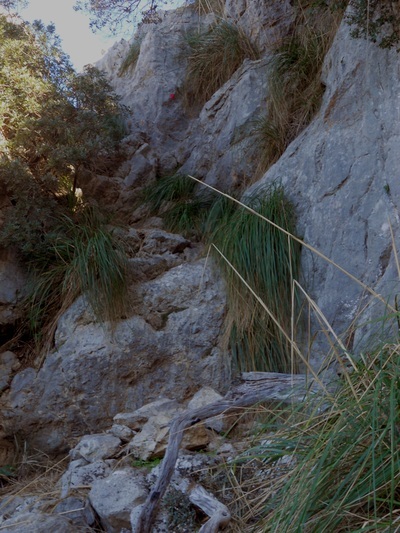 You are looking down a steep bank on to the Na Mora torrent valley. 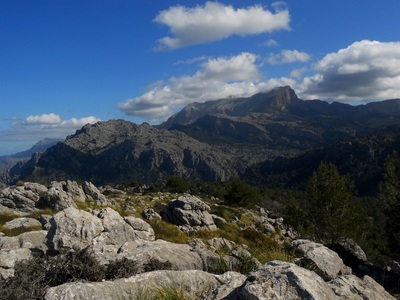 The Pas de s´Heura goes up mountain side on the right, there is no other trail going east lower down in the valley. 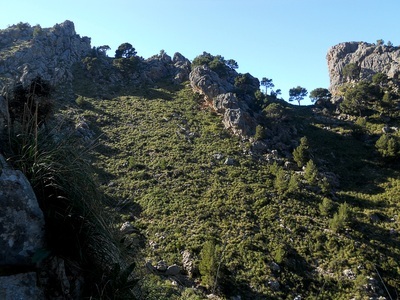 To reach the start of the scramble, go down the bank in front of you (riddled with cairns) and try to aim for the cairns on the right as much as possible. 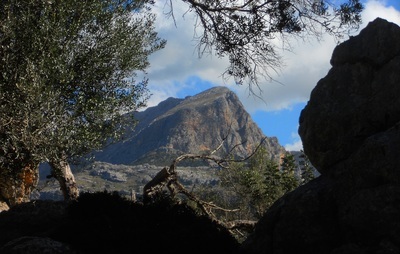 You will eventually find a trail leading you to a small dry stream bed, that you cross; slightly further is the start of the scramble, once again well marked with a huge cairn and many smaller ones beyond. 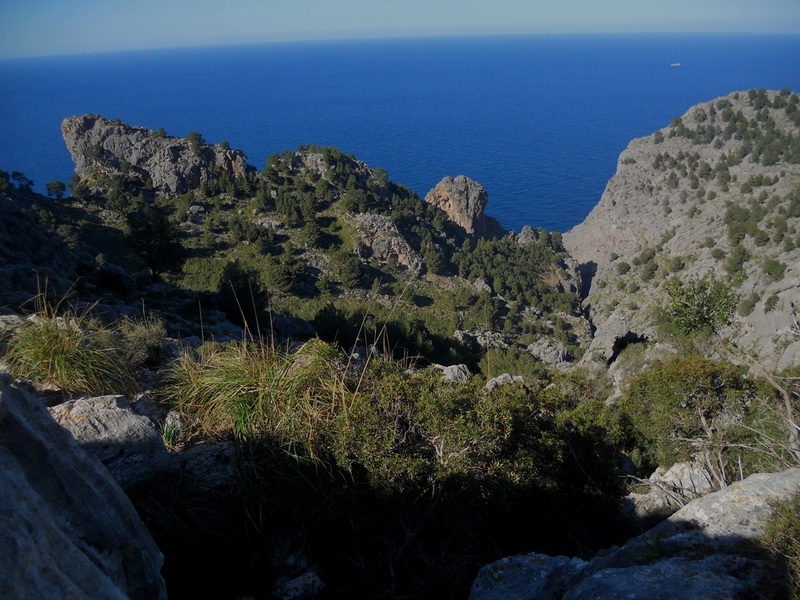 Whilst the "Pas" refers only to the first two short diagonal ramps you have to climb, the whole climb takes 30 to 45 minutes; you may have to backtrack if you lose the cairn trail, as the path is very much overgrown and the best way ahead is not always obvious. 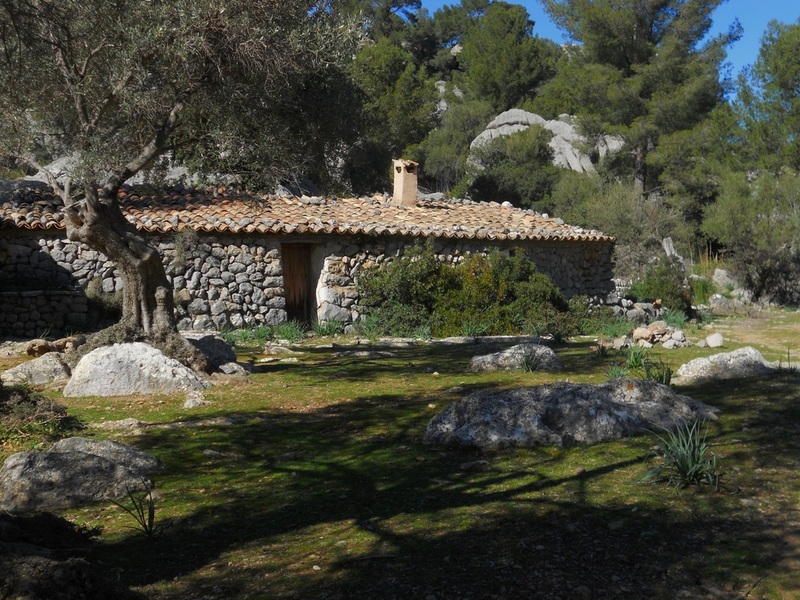 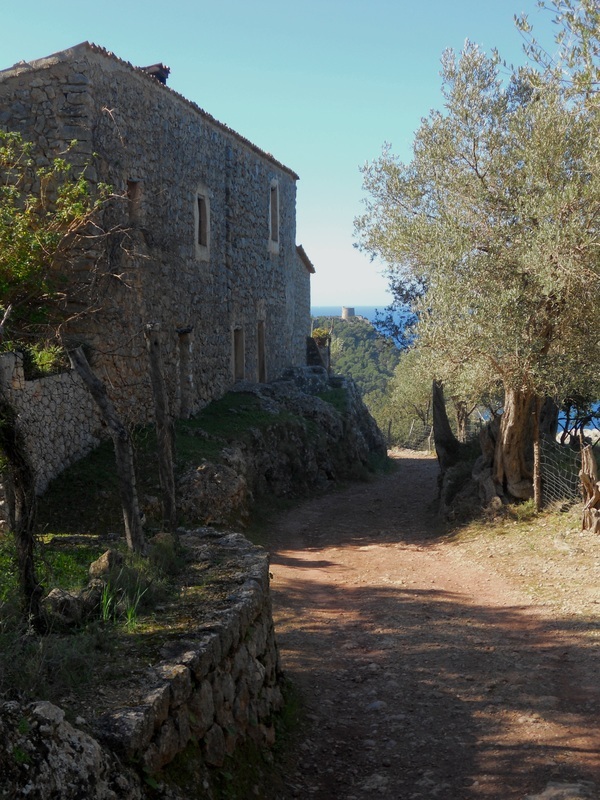 You will eventually reach the "Pla d´en Mateu" (Mathew´s flat), a terraced olive grove at the top of the climb, from where a distinct dry stone path will lead you to the cute Tanca d ´es Bou house where you will join a wider track. Follow this, go past the turn-offs to the Ballitx valley, pass the gates with the "big game hunting" signs and reach the ridge overlooking Port de Soller. 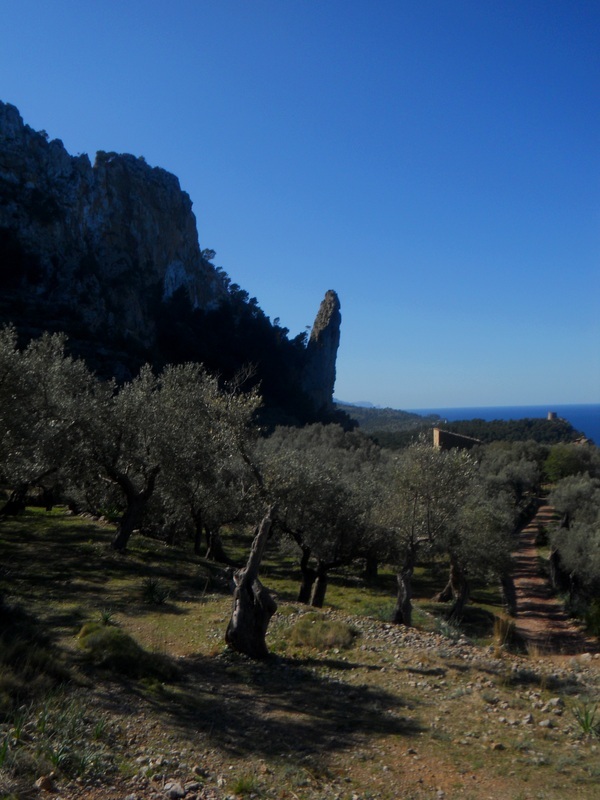 Take the middle track straight ahead, winding down the hill to the Font de Salt (the jumping spring). 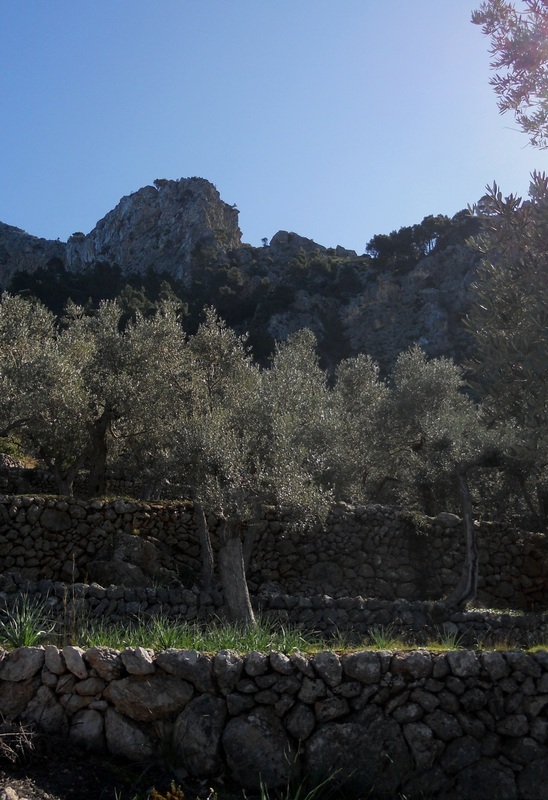 At the fountain, take a left , go over a metal reinforced wooden style through an olivar (olive grove) and onto a drive-able track that will take you, after many a bend and detours, all the way down to the Cami de Sa Figuera road and onwards back Port de Soller. 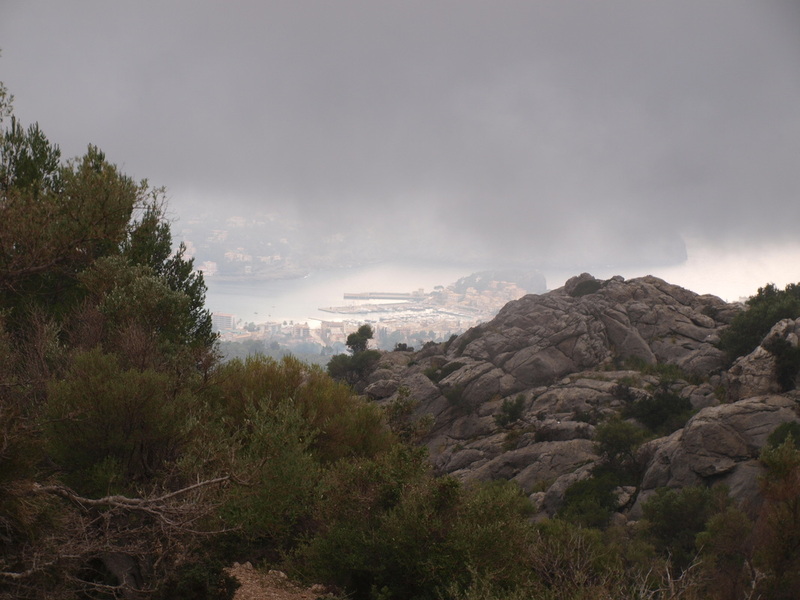 The trail on the right hand side of the fountain could offer a much more direct way back to the port, but the right of way along this path is unclear. 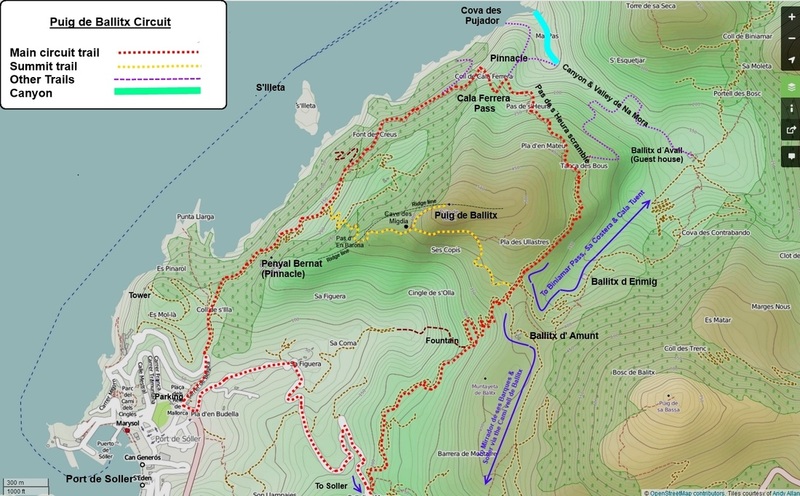 Start off as for the circuit route. 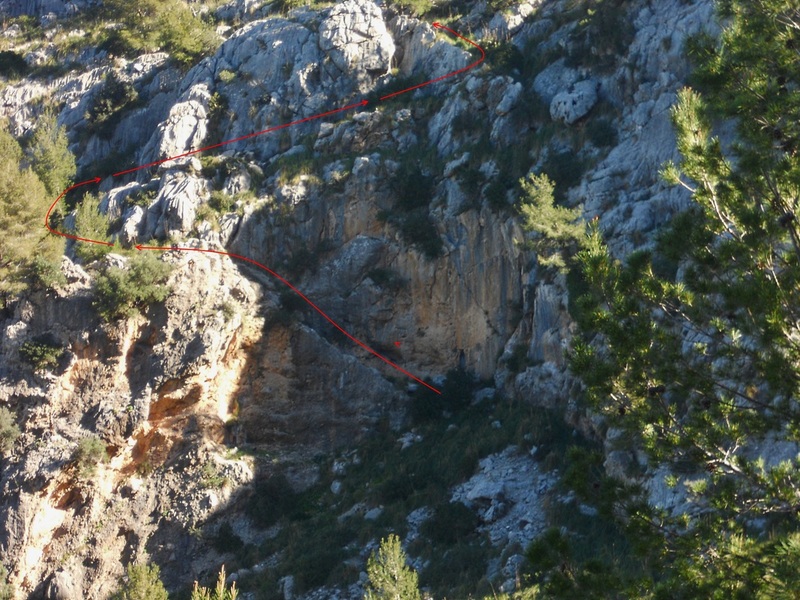 Half an hour or so along, take the gated cemented track to the right labelled "Can Bardi". 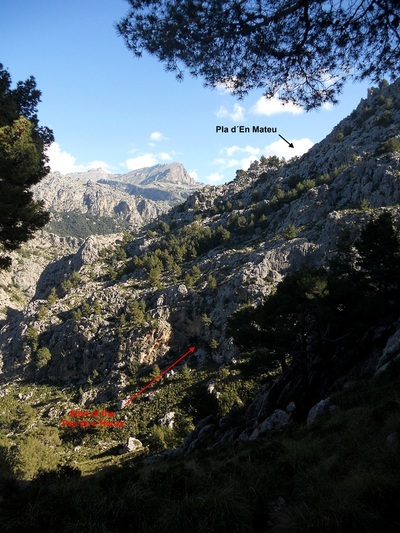 Spare a minute to look up to the ridge and identify where the Pas d'en Barona is likely to be. 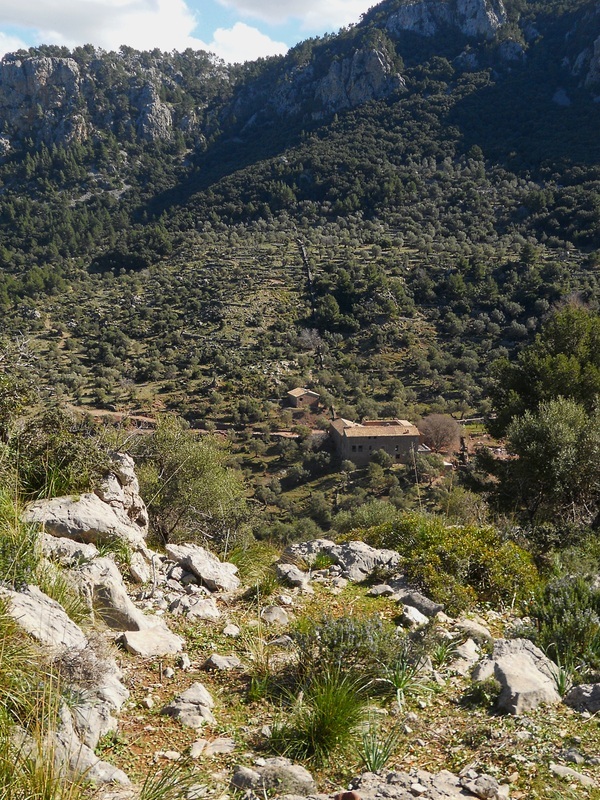 The track winds its way up: shortly after the last bend take a fairly faint path to the left leading to a small house above the road. A small path starts along the right hand wall of this small house, that you follow directly uphill, climbing up the terraces through the woods behind the house. 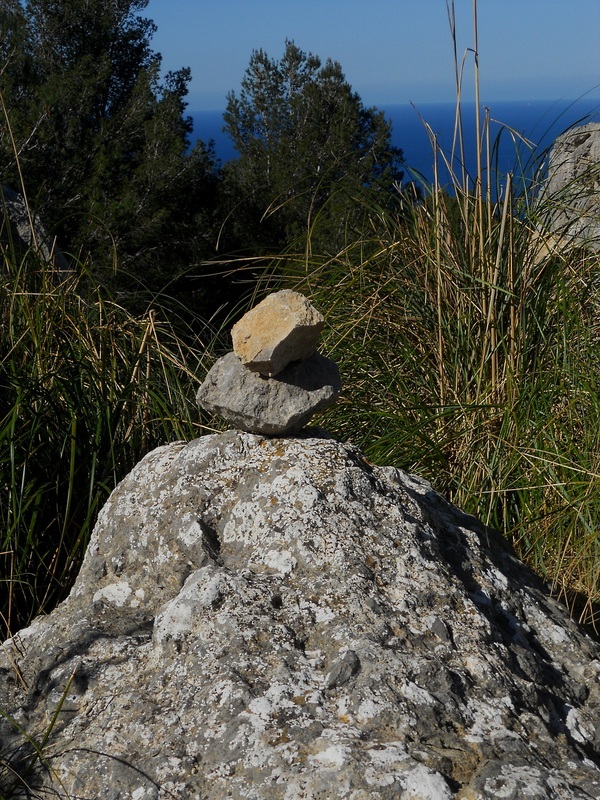 There are very few cairns to mark the path, just follow what looks like the most trodden way up. You will soon reach the bottom of the cliffs, where you take a right. The left way leads to a fenced off area. There are a few cairns along this section, showing the way up the consecutive ramps along the Pas d'en Barona to reach the ridge. Care is needed on a short but exposed passage here, easily overcome. You will reach the ridge in 10 to 15 minutes from the start of the "Pas". The cairn line will take you slightly to the south of the ridge at first, before climbing steeply back to the ridge under a small cliff: a dry stone ramp will allow you to overcome this easily. 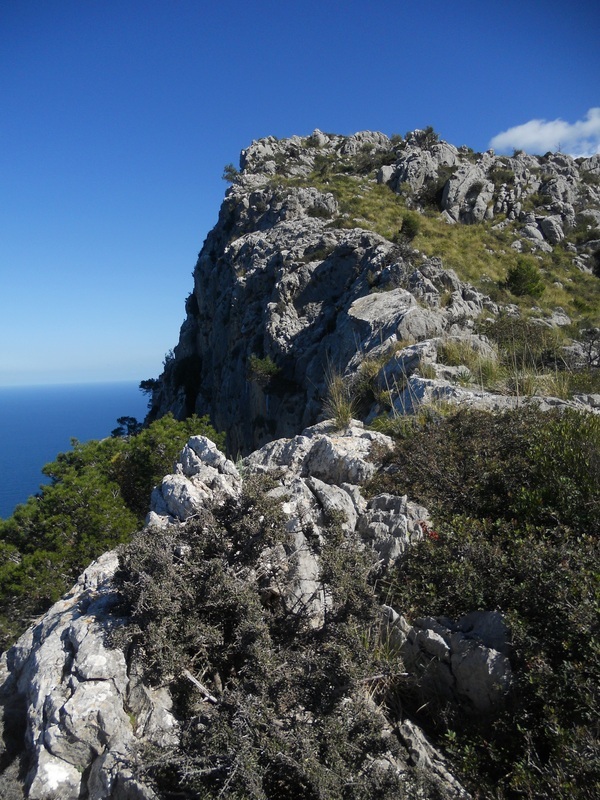 The path then stays on the southern side of the ridge, till the junction by the cave de "Migdia" is reached. 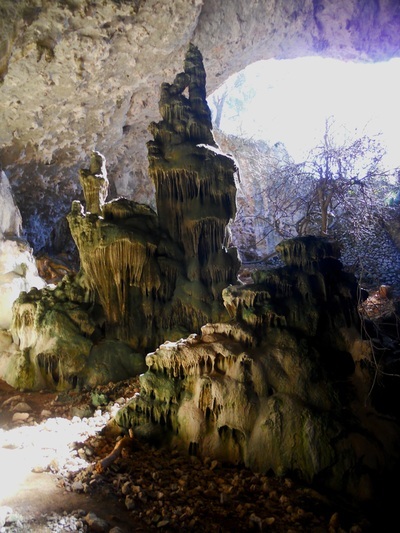 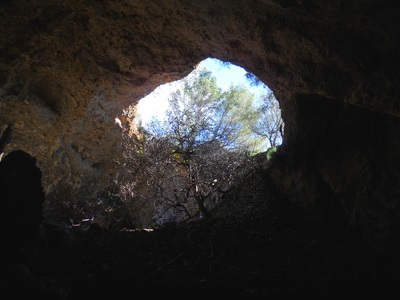 Take a cave tour, then chose the right hand path onto the summit (15 min). Back track to the cave and follow the path in the direction of the Ballitx d'Amunt farmhouse.When you reach the gate with the "big game hunting" sign, turn right towards the Font de Salt for the easy but tortuous route back or left for the longer and wilder route anticlockwise around the Puig de Ballitx, via the Pas de s'Heura and Cala Ferrera pass, bringing you back ultimately to Port de Soller (see routes, descriptions above).